A visitor to the Dublin Coin Fair in February asked me about Finlay's bank. A bit of research suggests that there were three different registrations of Finlay's bank in Dublin, with changes in the partners. 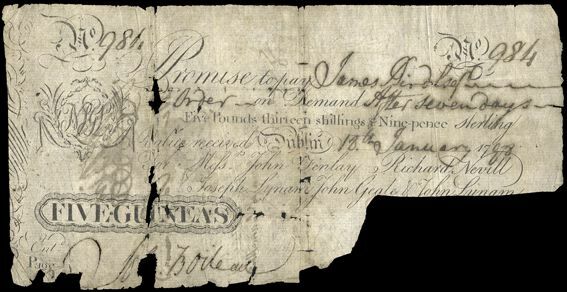 Finlay’s Bank is reputed to have been a significant issuer of banknotes over its long history but today its notes are scarce, particularly in issued form. The reason for this may be due to the orderly wind down of its operation in 1829 with full payment of issued notes outstanding. The two examples posted previously appear to be issued notes which have been cancelled. The 1798 example has the signature area removed while the £20 note is unusual in having several details crossed out. Last edited by DOC on 08 Dec 2018 13:03, edited 1 time in total. Here is a £10 unissued note from this bank with Thomas Finlay as lead partner. An interesting feature is the counterfoil on the left, a useful feature for recording details when notes were issued. It reminds me of the counterfoil on modern day cheque books. You don't often see them with the counterfoil. Where it was cut off seems to be a bit random. The £20 above has all of the left side design intact, whilst the 5 guinea has had most of that design feature cut away. 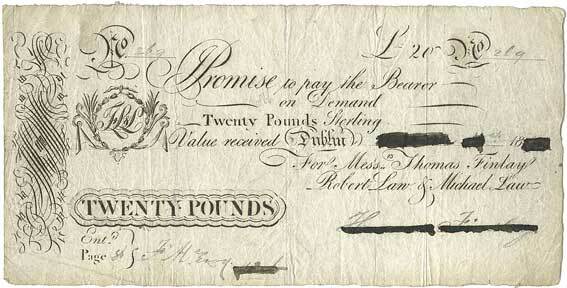 the orderly wind down of its operation in 1829 with full payment of issued notes outstanding. An orderly wind down of operations was surely unusual for a private bank of that era! Yes, chaotic bankruptcy was more the norm for the early Private Banks in Ireland !